Though sacred to worshippers of Jone and Jode, the temple at Moonmont has fallen on hard times. The chaos in Reaper's March has cut off the flow of pilgrims to its shrines, and the Two-Moons clergy has had to abandon the site until peace returns. 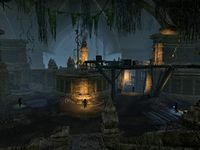 Moonmont is a crypt in southern Reaper's March. Moonmont Objective: Deal with the Dark Mane's corruption. 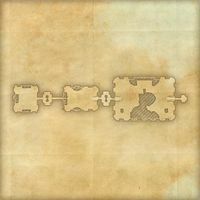 Desecrated Ground: Retrieve a sacred relic from the Moonmont vault. The Path to Moonmont: Meet the Lunar Champions at the corrupted temple. To Moonmont: Seek out your destiny at the temple of Moonmont. 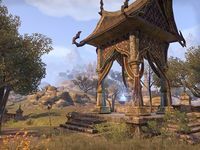 Moonmont Wayshrine is located northeast of Moonmont, on the western path after the road splits.